A police officer was fatally shot in the head while sitting in a police vehicle in the Bronx early Wednesday, according to law enforcement officials. The officer has been identified as 48-year-old Miosotis Familia. Alexander Bonds, 34, came up and blasted Familia through the window without warning, sources said. It seemed to be a deliberate “cop assassination,” one law enforcement source told The Post. Bonds approached at 12:30 a.m. as Familia sat inside a temporary headquarters vehicle at East 183rd Street and Morris Avenue in Fordham Heights, according to sources. Cops Bonds say was on parole for a 2014 robbery in Syracuse. 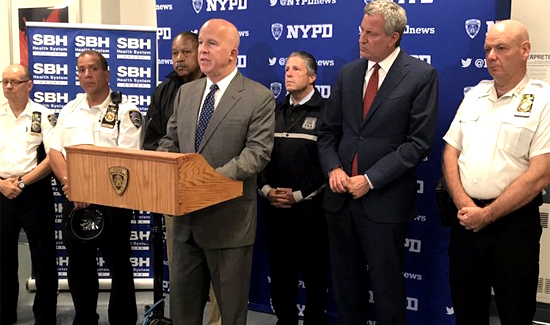 Familia — a 12-year-veteran who is with the Anti-Crime unit of the 46th Precinct — was rushed to St. Barnabus Hospital, where she died during surgery. “This is absolutely an unprovoked attack,” said NYPD Commissioner James P. O’Neill. The commissioner said Bonds fired one round, after which the shot officer’s partner called for backup. Two other officers, Sgt. Keith Bryan and Officer Joseph Ayala, confronted Bonds about a block away, and shot him dead, police said. A bystander wound up being shot in the stomach, and was in stable condition at St. Barnabas. A silver revolver was found near the dead suspect. Cops rushing to the scene were warned by radio to keep their patrol vehicle windows closed while responding. At least five evidence cups covered spent rounds along Morris Avenue between 183rd and 184th streets. Witness Jay Marzelli, 17, at first thought all the gunshot was fireworks.